It’s hard to believe that I’m finally in Costa Rica after wanting to visit this country for the past ten years, ever since I worked with Dr. K. who mentored me when I was in graduate school. He grew up in Costa Rica and moved to the USA when he was 16 years old. I signed up to go on a tour last April but had to cancel it when I had complications after cataract surgery. The Lord sold my condo after ten months on the market and I was able to buy another house. They are fixing my new house over the next few weeks while I tour Costa Rica for 10 days and then stay with a friend from church for a couple weeks. It is so kind of the Lord to give me this break between moves. My flight last night was smooth and on time. I sat next to a Costa Rican grandma and her teenage grandson. She only spoke Spanish, but he spoke excellent English. She asked me what time it was and I told her in Spanish! I’m glad I finished my 16 Spanish lessons on CD. How I wish I would have learned Spanish as a child. It’s kind of tough to learn at my age. I fell into bed last night at midnight at this beautiful hotel in downtown San Jose. It took about an hour to go through customs followed by a 30-minute taxi ride. The only electrical outlet in the room is about 7 feet from the foot of the bed. So I blew up my air mattress and switched all the sheets and pillow around so my head was at the foot of the bed. 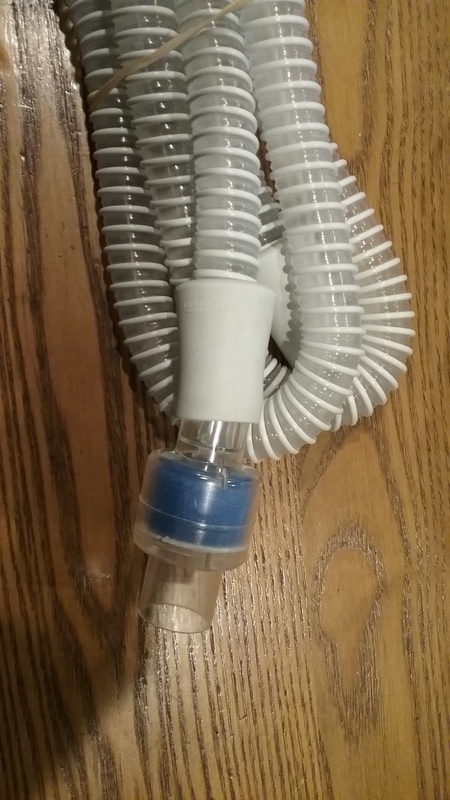 I put my CPAP (Continuous Positive Air Pressure) machine on a chair and stretched the cord to the outlet as far as it would go. I should have brought an extension cord. It worked well and I slept soundly which was a blessing. I remembered to get out of bed on the opposite side so I wouldn’t trip over the taut cord. I was cold and there is no heat in the room so I slept in my heavy sweatshirt. San Jose is the city of “eternal spring” with an average temperature of 70 degrees since they are at 3800 feet elevation. At the age of 40, I told my doctor I couldn’t stay awake during the day and often woke up tired with headaches or choking. He ordered an all-night sleep study at a sleep center. They glued electrodes all over my head, put a belt around my chest, and then told me to sleep as they recorded me all night on video and by electroencephalogram (EEG). They concluded that I stopped breathing many times during the night, my oxygen level dropped, and I had no deep stage sleep. The doctor prescribed a CPAP machine which blows humidified air into my lungs all night to keep my airway open. He said I was born with a small airway which collapses as I’ve aged. It took me several months and several different masks before I was able to sleep all night. I always encourage newly diagnosed patients to keep trying to sleep with CPAP for several months and not to give up. Many people say the mask makes them feel claustrophobic. If a person does not treat his sleep apnea, he has a much higher incidence of heart attack, stroke, depression, and death. They now can diagnose it with a simple sleep test that can be done at home with a pulse oximeter attached to your finger. It is much easier to sleep in your own bed at home rather than go to a sleep center. I discovered very comfortable nasal pillows (Swift Fx) rather than a mask. The mask actually made a permanent bump on my nose that had to be removed by a plastic surgeon. Occasionally, I still have trouble going to sleep some nights so my pulmonologist prescribed Lunesta that does not affect my apnea. I never take it two nights in a row since it can be addicting. It also helps me adjust to a new time zone when I fly east or west and have jet lag. Transcend travel CPAP with the 3-night battery and Swift nasal pillows. I’ve learned how to travel internationally with my CPAP machine. The airlines allow you to carry your machine on board in a separate bag since it is medical equipment. I never put it in my checked bag because it is a fragile machine and could break as they toss your bag around, or your luggage could be lost. In the USA, most insurance companies will only pay for a new machine every five years. They cost $400-$700. 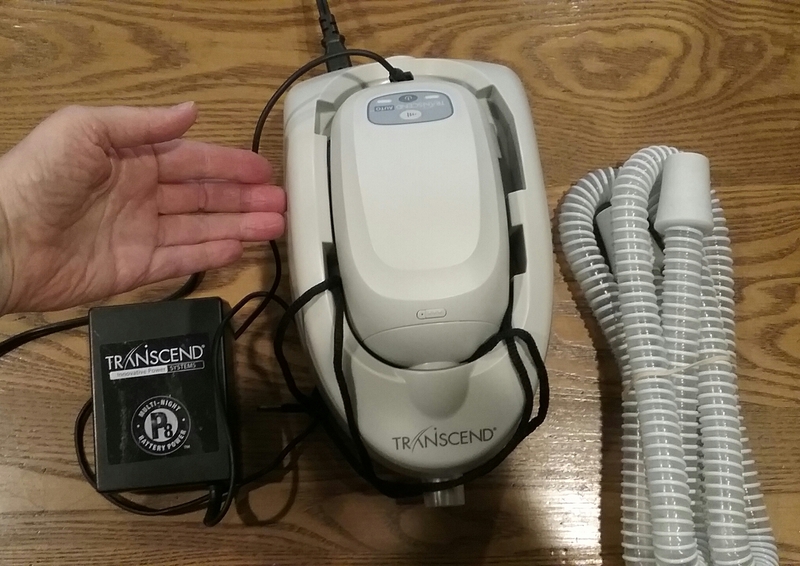 Four years ago before I went to Ecuador, I invested in a small travel CPAP (Transcend) and a three night rechargeable battery since they have frequent power failures there. Insurance does not cover the cost, but I like to do international travel so the small size and rechargeable battery was worth it to me. It includes converters for different electrical outlets around the world. I wish I would have had the battery when we lost power for six nights during a blizzard six years ago. That was tough to go to work every day without any sleep. This is a humidifier that attaches to the hose, but it only lasts for a week and doesn’t humidify the air very well for me. 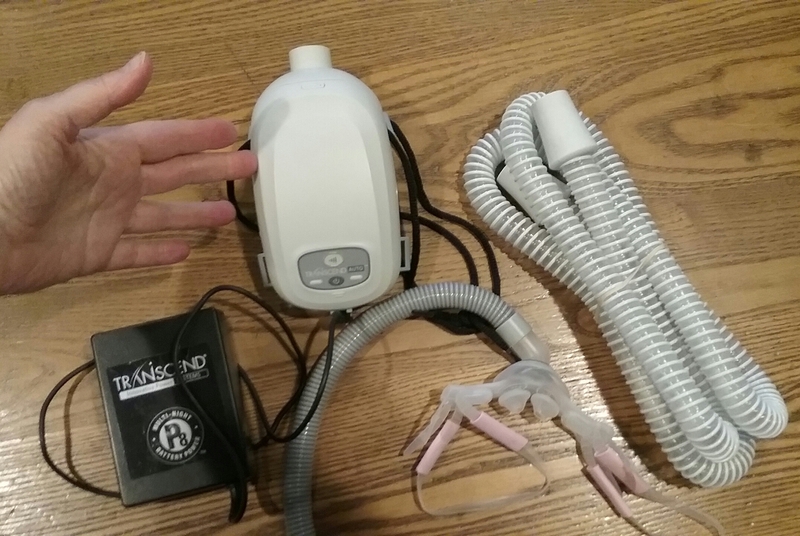 The water chamber humidifier for the travel CPAP is quite large unfortunately and requires a separate electrical cord. It does not run off the battery. I also used it for ten weeks in Costa Rica last year and it worked well. The battery solves the problem of outlets far from my bed. I just recharge it the next day. I forgot to bring extra filters for my machine. The active volcano ash in the air clogged the filter so I washed it daily until it fell apart. It’s almost impossible to get medical equipment through customs, so I placed a paper tissue over the air intake port to try and filter the air as much as possible. I also forgot to bring normal saline nasal spray with me for my dry nose. I couldn’t find it in the pharmacy or make the pharmacist understand what I needed. I finally went to the school doctor and paid him $40 for an office visit. He told me to ask for “Steri Mar” (sterile sea water). I did and finally purchased it for $30. So for $70 I had sterile saline nose spray which I normally buy for $3 at Walmart. My $70 sterile saline for my dry nose. 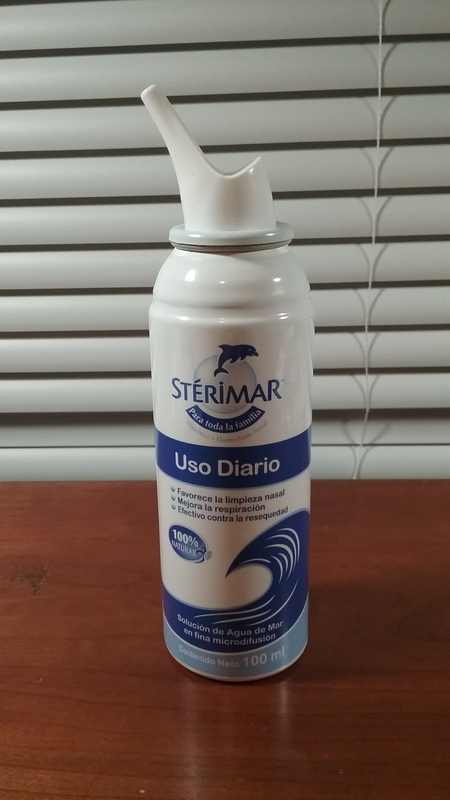 It’s called Sterimar in Spanish. Sleep is such a gift from the Lord. I thank Him that these devices are available for us in this day and age. Next postIs Anything too Hard for You, Lord? In all masks, the silicone rubber cushion also has been a source of discomfort. From what I’ve seen at other blogs, mask discomfort is a big stumbling block to many users. The RTs I’ve seen and the NP at the sleep medicine clinic suggested a memory-foam-lined cushion, but I’m subject to skin infections, and adequately sanitizing the foam would destroy it and damage the other plastic parts. The NP also suggested an after-market cloth cover, but the price is steep for such a simple modification (what isn’t, in medicine? ), so I gave it some thought, and came up with tubular cotton stockinette, which can be purchased inexpensively in bulk online. After considerable experimentation with flat-knit stockinette (the cut edges of which curl), I’m now using 2-inch ribbed stockinette (which doesn’t curl), cut into 9-inch lengths and doubled over on itself, and then stretched over the silicone cushion with the folded edge towards the opening. This considerably improves the comfort of the mask against the skin, and doesn’t seem to affect mask leakage (as far as my history with poorly-fitting masks is concerned). I’m not an expert on masks. I like your inexpensive stockinette solution. Thanks for sharing it which may help others. I also struggle with nasal congestion. I used fluticasone (Flonase) for years until I realized it was causing palpitations and my atrial fibrillation. Now I just use normal saline spray or gel with the humidifier which works most of the time.